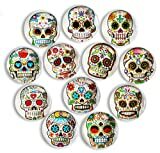 ★Size - Package includes 12 different Sugar skull pattern magnets, each of them is about 1" x 1" x 0.4". ★Versatile - Apply the new arrival unique magnets to any metal or magnetic surface, such as magnetic board, dormitory, maps, refrigerators, air conditioners, lockers, washing machines, magnetic dry erase board, iron office files etc., and also can clip photos. ★Decorative -Round crystal glass, whimsical, bright up your home or office. 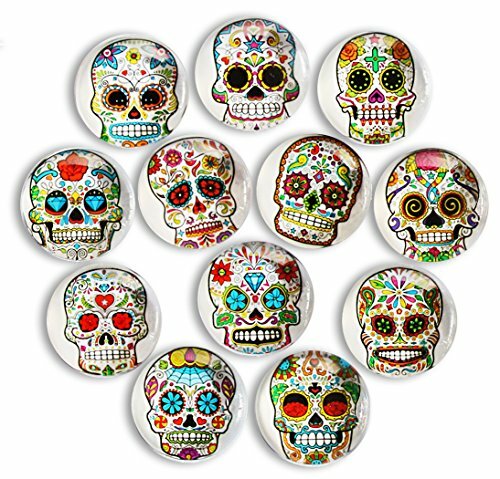 ★Safe Magnets - Durable crystal glass and a smooth round magnet shape to avoid harming surfaces and have a super adsorption. ★Perfect Gift Choice - Comes with 12 different patterns, colorful, interesting, funny and packaged in a elegant mesh bag, great gift ideas for your home and holidays.